UNSIGNED TRACING OF YELLOW KID ART! ORIGINAL! 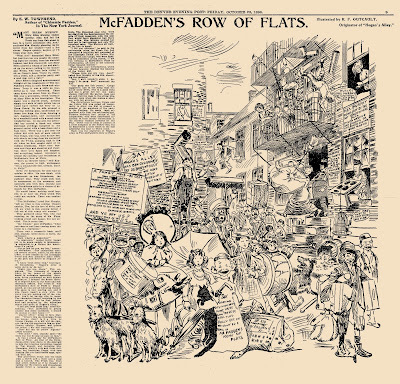 New York Journal, Sunday, October 18, 1896. TRACED! 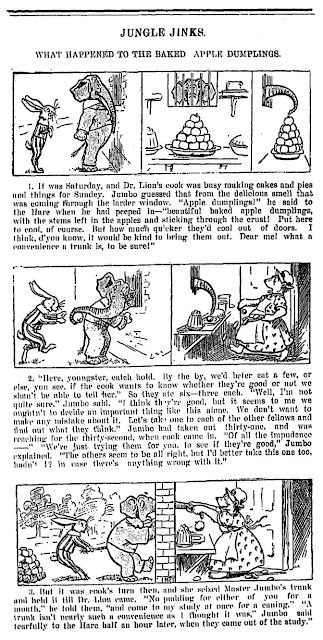 The Denver Evening Post, Friday, October 23, 1896. 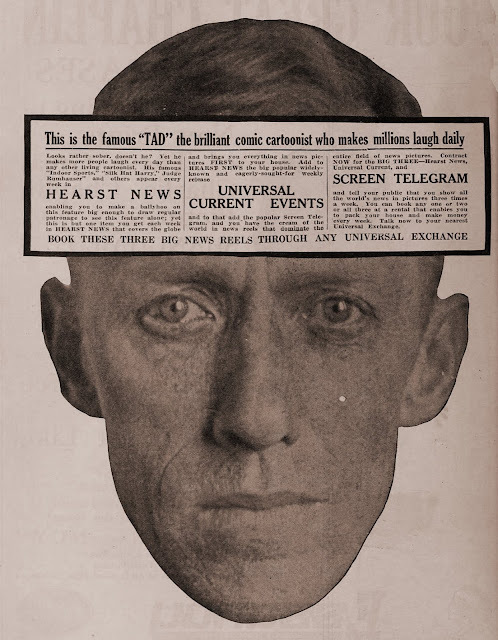 W.R. HEARST & R.F. OUTCAULT. 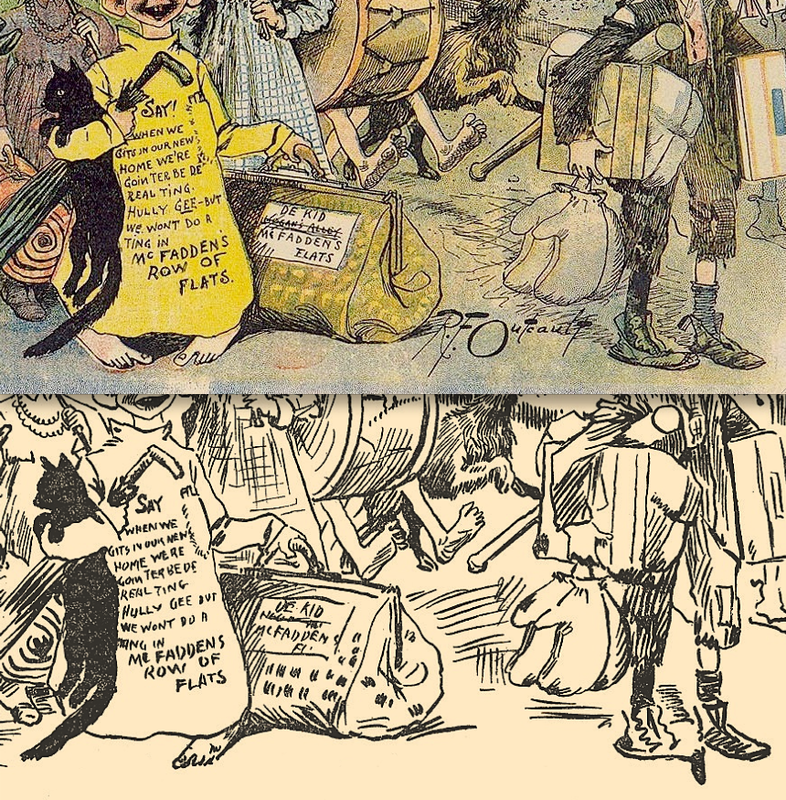 The Historic, Glorious, Grand and Colorful move the Yellow Kid made from Pulitzer’s The World to Hearst’s New York Journal on Sunday, 18 October 1896 had a peculiar follow-up, five days later, in The Denver Evening Post, which published a badly traced black-and-white version of the first Hearst page. No further details known. 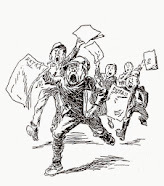 But had Outcault known he would have been furious. The Kid even misses a foot. Click and compare! 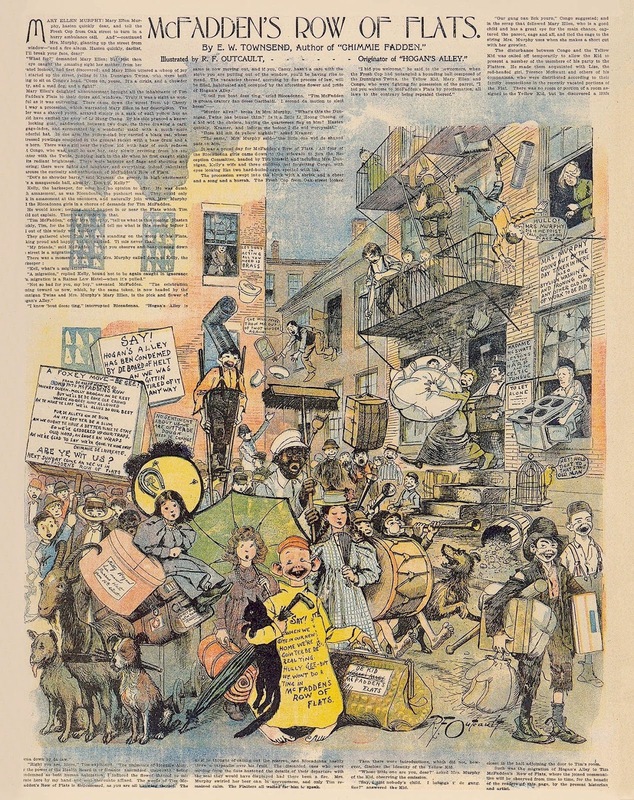 P UBLISHED here in February 2015, the Daily Mirror comic strip series index compiled and researched by Leonardo De Sá has presently been brought up-to-date through 2019. 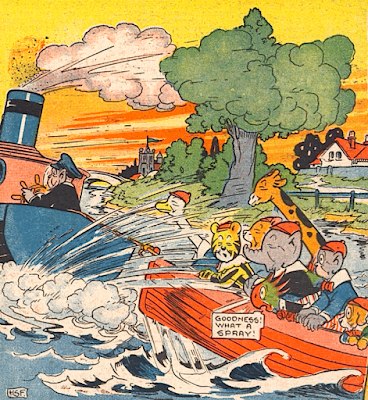 It now includes an entry on the appearance of Tiger Tim (even if it wasn’t a series in the Daily Illustrated Mirror it became one afterwards), a new entry on the Disney Mirror supplement, information about the demise of Roger Kettle’s western comic strip Horace, and several other bits of miscellaneous data Leonardo was able to uncover. 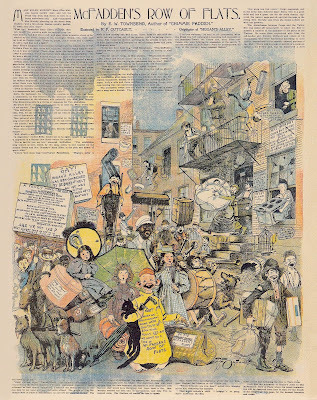 The illustrations used in this post are of poor quality but useful enough for reference purposes. Note: The Daily Mirror began printing comic strips in full colour on 06/Jun/1988. Mrs. Hippo’s Kindergarten, April 16, by Julius Stafford Baker. ★ One of the longest-running characters in children’s fiction, Tiger Tim was originally created by Julius Stafford Baker for the Daily Mirror in a one-shot called Mrs. Hippo’s Kindergarten in 1904. 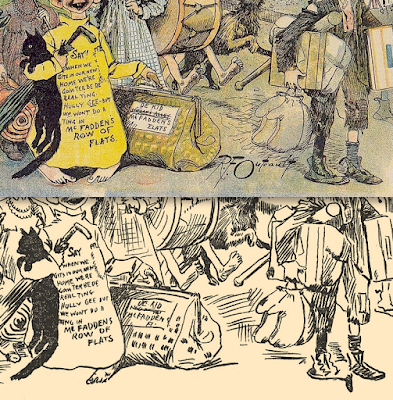 Baker was known for his large slum kids panel Casey Court — similar to Outcault’s Yellow Kid cartoons — in Chips (1902). Tiger Tim ended in 1985 in Jack and Jill. 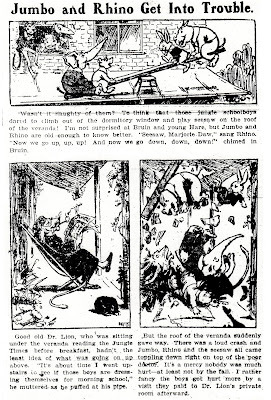 Jumbo and Rhino, Sep 1, Montreal Standard, by Mabel F. Taylor? 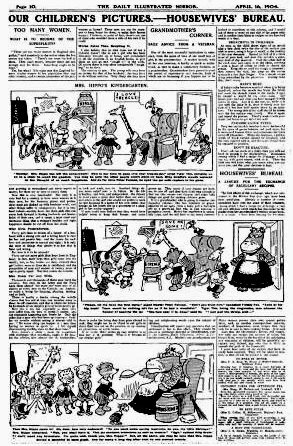 ★ An unidentified British strip, a one-shot titled Jumbo and Rhino Get Into Trouble appeared September 12, 1903 in the Canadian Montreal Standard newspaper. 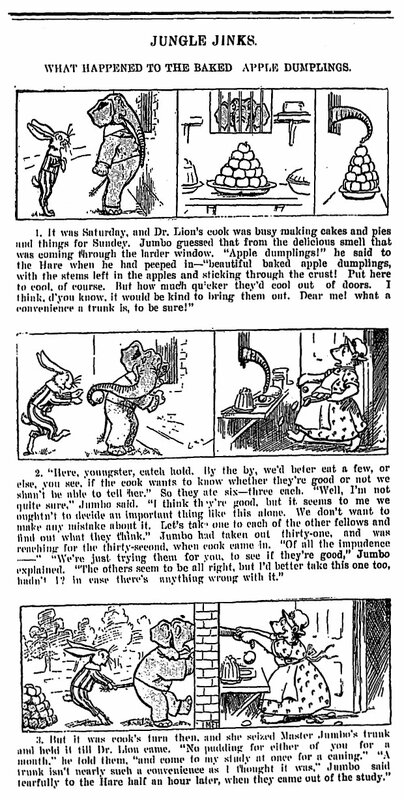 It could even be a Jungle Jinks since the third panel has a newspaper labeled Jungle Times. The signature looks like ‘MT’ — is it by Mabel F. Taylor perhaps? 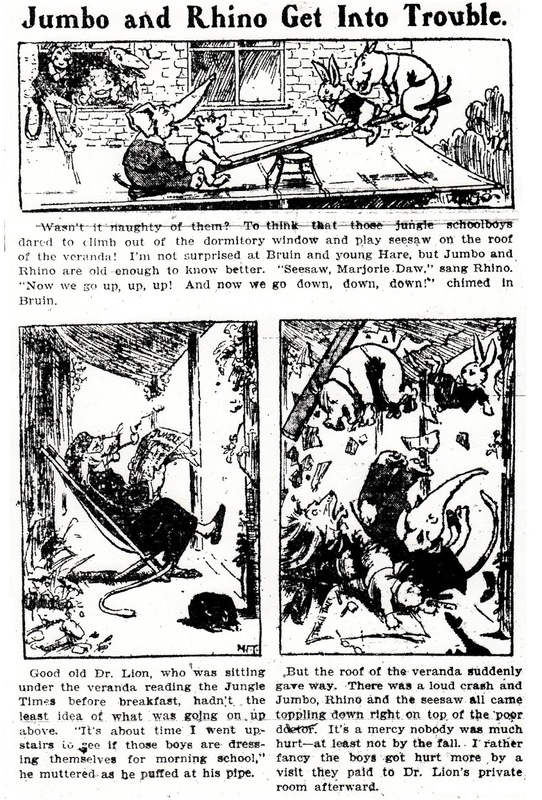 Jungle Jinks, New Zealand Daily Graphic, Dec 30, possibly by Arthur White. 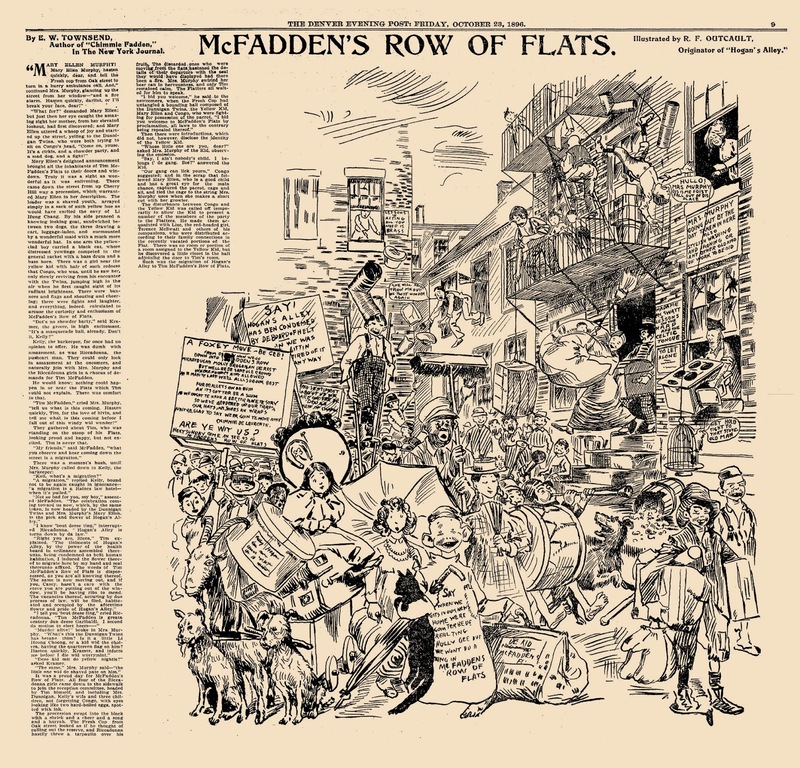 ★ Our full Daily Mirror comic strip series index 1904-2016 HERE. 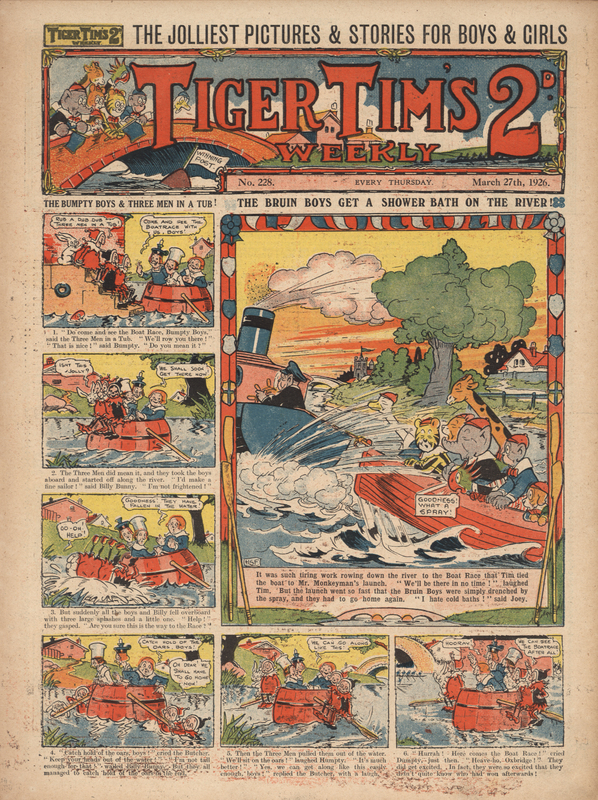 ★ Source of top detail, Tiger Tim’s Weekly, March 27, 1926, see the full cover signed ‘HTF’ HERE. 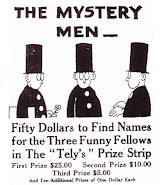 ★ Meanwhile, any additional information is welcomed, especially missing names of WRITERS and ARTISTS, gathered in our DAILY MIRROR comic strip series index. 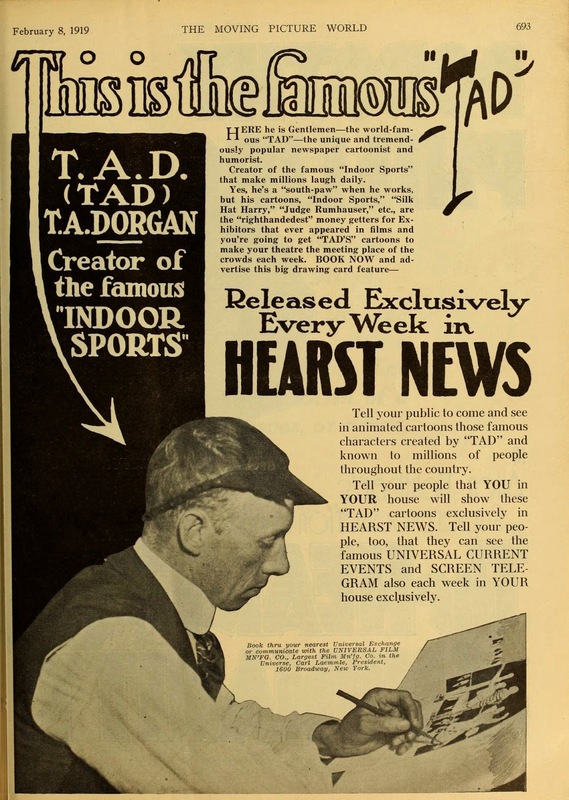 The Moving Picture World, Feb 8, with photograph of ‘famous “TAD”’ (1877-1929). Movie houses showed TAD cartoons in weekly newsreels from Hearst News.